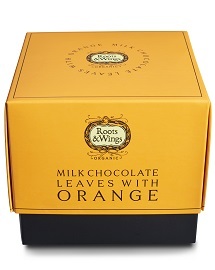 Food Revolution is the home of our own range of products - Roots & Wings Organic. Roots & Wings Organic products are made from the best ingredients, carefully and ethically sourced and produced by craftsmen to our recipes across the UK. Our Chocolate leaves are handcrafted using organic chocolate from the Dominican Republic. Organic and fair trade, available as dark chocolate, dark chocolate with peppermint and milk chocolate with orange. The maple leaf shaped chocolates come packed in their own envelope, with 12 leaves per pack.